The Garmin Forerunner 630 can record more training dynamics and physiological measurements than any running watch before it so how does it really match up? We tested it for a week and this is what we found out. What are the Key Functions of the Garmin Forerunner 630? The new touchscreen GPS running watch records everything from steps, calories, and distance to comprehensive data like stride length, lactate threshold, and ground contact time/balance. When coupled with the heart rate monitor the Garmin FR630 can measure your maximum oxygen consumption and predict your recovery and your race times. With multi-function capabilities the GPS watch can also measure bike cadence and is waterproof up to 50m. It's easy to use, dependant and has added features such as smartphone compatibility so it can receive emails, texts, and calls, as well as control music wirelessly when paired. All that and it is super lightweight weighing in at only 42g. How Does the Garmin Forerunner 630 Compare? The new running watch is both GPS- and GLONASS-, the Russian version of GPS, enabled. By combining the power of 31 GPS satellites with 24 European GLONASS satellites, navigation data is faster and moreaccurate. Back by popular demand, the FR630 now offers navigational assistance allowing you to navigate back to a starting point or to a saved waypoint. The Garmin FR630 measures the variability of your heart beat alongside your BPM to help estimate lactate threshold, your maximum performance level which is helpful for race pacing. 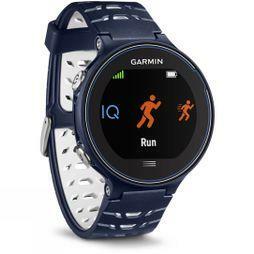 It also measures and records your running efficiency, your vertical ratio which can help you improve your technique and performance in real-time. As well as recording the ground contact time of each individual foot gives you more data to help you optimise your foot patterns, running symmetrically for greater efficiency and fewer injuries. The Garmin FR630 can also calculate your stress score which helps analyse how you're feeling, and how much physical and mental stress will affect your performance. With an impressive 16+ hour battery life with both GPS and HRM enabled in training mode, the new Garmin is favoured considerably on the FR620 which holds up to 10 hours battery life. Despite the same dimensions the FR630 has a 31.1mm screen, 44% bigger than its FR620 predecessor. You can now also create additional sports profiles, specific to your needs, rather than just a generic other profile. The wealth of data that it can measure is impressive, and the more you run with it, the more accurate your training data becomes as the FR630 analyses an evolving cache of running dynamics and physiological measurements. Most importantly, the ability to reduce your risk of injury by finding an imbalance between your foot patterns in real time is ground-breaking. The quicker you can react to and fix these problems the more efficient you'll become. It's beginner friendly too. The navigation is simple to use, the touch screen works well, and the real-time data display is customisable giving you only the information you want. It's a lot lighter and has a bigger screen than other GPS watches so you can easily see different metrics while running. Whether you're a beginner runner looking for a watch with growing room, or a runner about to embark on a longer training plan, then this is the watch for you. The newest running gadget to come from Garmin is the entry level Forerunner 10. This is no longer a fancy, tricky to use, gizmo-gadget to be avoided by technophobic runners - it is a stylish, affordable and easy to use GPS watch. View on our website for full tech. spec's and pricing: Garmin Forerunner 10. The latest edition to Garmin's truly capable and versatile watch range is the Forerunner 735XT; the lightest multisport watch, ever. Weighing in at a light 40.2g, compared to the FR920XT weighing in at 61g, the new Forerunner 735XT features Garmin's Elevate™ wrist based heart rate, giving you a totally unrestricted experience, so you can focus 100% on what matters.